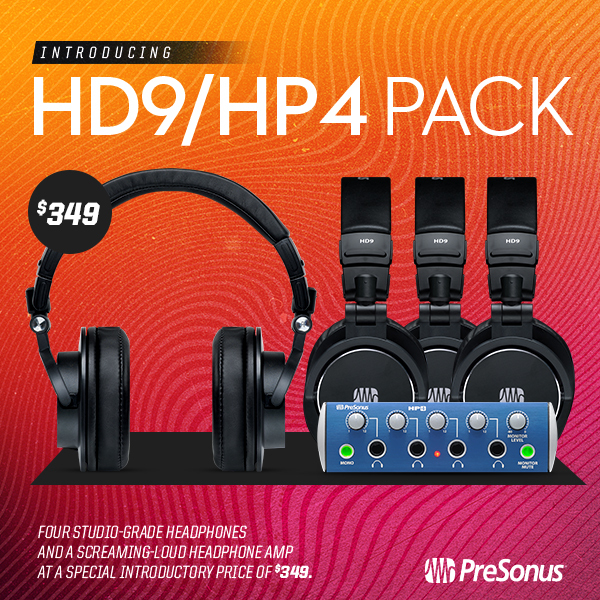 Introducing the HD9 PRO PACK with a Special Introductory Price! Also, most importantly, the NEW HD9 and HP4 Pro PACK! Let us introduce you to the latest Pack in the PreSonus Family! Here’s what you get for $349.00! These headphones are no joke! They are comfortable, CLEAR and accurate! AND you get FOUR with this pack! These guys were actually selected as an Editor’s Choice by Music Inc. Magazine at Summer NAMM 2018 (pg. 66)! The perfect companion to the HD9s– the sound is clear and clean, with a wide dynamic range and everyone will be able to hear! ALL THIS IS A $420.00 VALUE! This is a Pack you gotta join. This offer is available worldwide at this special introductory price! Posted in Audio Interfaces, Promo / Discount | Comments Off on Introducing the HD9 PRO PACK with a Special Introductory Price!